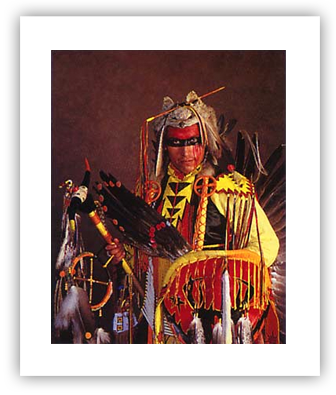 The Powwow Editions are four lithographic fine art prints in limited edition. Utilizing soy-based inks printed on 120-pound paper, they are of exceptional quality and exhibit brilliant detail. Each print is signed, numbered, and includes a certificate of authenticity. Image size: 16 x 20 in. Total size: 19 x 23.5 in. A young Fancy Dancer from the Yakama Reservation, twelve years old when photographed, dances to the spirit of ancestral drums at the 4th of July Powwow in Nespelum, Wa. Beginning his dancing in the Sacred Circle when he was two years old, he continues to live and love powwow life. The thousands of miles of traveling the Powwow Trail has been priceless for this boy who dances from his heart. Unframed set of four: $550.00 plus shipping and handling. 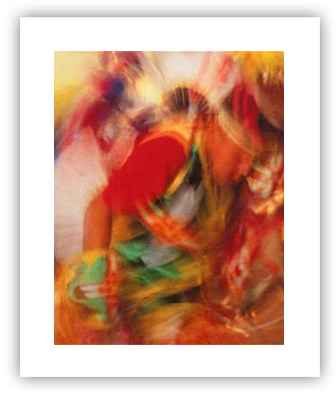 Unframed individual print: $150.00 plus shipping and handling. "HOW-KONA SUNK-TOGEJA WANKANYA MANI MIYE-NO Kevin Haywahe HO-MAKSINA JEHAN DA WAWAS CEGA-KINA OYATE E. DAHAN-WAHI-NO-OWACI OPEYA WAONKTA HAHO PINAMIYA ME-TAKIEYAWASI... Belonging to the Assiniboine Tribe of Saskatchewan, Canada, my Grandfather, who was a tribal healer, gave me his blessings to be the champion Traditional dancer I am today. Thank you Great Spirit... POWERFUL WALKING WOLF"
"I am proud to be a full-blooded Kutenai from the Confederated Salish and Kutenai Tribes of Montana's Flathead Nation. The regalia I'm wearing was made by several members of my family, with many parts given to me by friends: Porcupine roach with owl feathers, eagle head staff, bear claw necklace, bone breastplate, antique bells. My bustle is a powerful display of eagle feathers given to me by my brother. The American flag placed in the center of the bustle is my expression of pride for my country. I dance with honor for my friends and family." "I was born in 1912 to a Cheyenne mother and Siletz father. 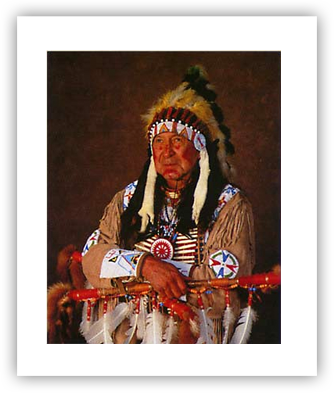 After surviving World War II (my ship was sunk at Okinawa), I looked back to my Indian roots and realized how rapidly the cultures were being lost, and how little understanding there was of my people. I longed for the wisdom of my heritage. 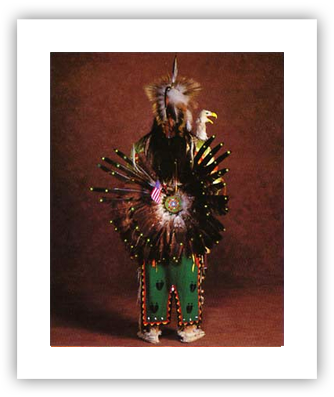 I dance and wear traditional Plains Indian clothing, and Eagle feather headdress, which represents my years of service and accomplishments. The arrows on my face were marks given to me as a child by the medicine man. They signify my protection from evil spirits."